Liverpool Hospital doctors Johnson Tang, Noah Freelander, Cale Burge, Chilan Nguyen and Sarah Khan have won the inaugural NSW Junior Doctors Conference 2018 Medical Challenge. A team of local junior doctors have shown they can’t be beaten when it comes to sharp clinical skills and performing under pressure. 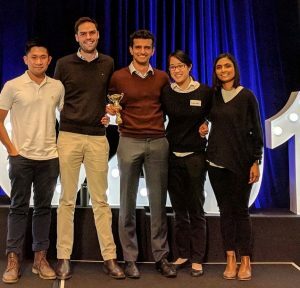 A group of second year doctors – Chilan Nguyen, Sarah Khan, Johnson Tang, Noah Freelander and Cale Burge – won the inaugural NSW Junior Doctors Conference 2018 Medical Challenge. Dr Tang said the Liverpool Hospital group had enjoyed being able to test their skills against other junior doctors. “You learn an enormous amount in your first few years as a doctor, particularly in a hospital like Liverpool Hospital,” he said. The Liverpool Hospital doctors competed against teams from Blacktown and St Vincent’s Hospital as well as a team of medical students. Karen McMenamin, the general manager of Liverpool Hospital, said the group’s success showed the quality of young doctors at the hospital. “The group were tested on their ability to treat difficult patients in challenging environments and on how they manage the challenges of life as a junior doctor,” she said. The team bested their competition in two rounds that tested their ability to assess patients with complex conditions and how they juggled the competing demands involved in being a junior doctor. This year more than 100 new doctors began the first phase of their careers at south western Sydney hospitals, part of record intake of 999 medical interns. The NSW Government has invested $740 million to redevelop Liverpool Hospital and transform it into an academic, health and research precinct. The redevelopment will include a comprehensive, integrated cancer therapy centre and new maternity and neonatal intensive care units along with improved diagnostic and outpatient services and research facilities.